OK - I have to confess. I am a pooriholic(!!!!) 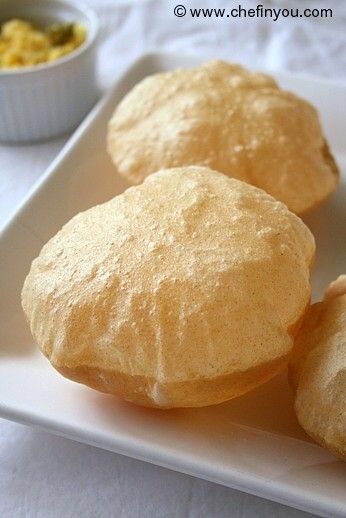 As long as I can remember, I have been a fanatic in my love for it, so much so that I think I can have poori for a whole week and not be bored with it. Then marriage happened and everything turned upside down. The first year of marriage saw me experimenting with loads of dishes and I was sure not going to miss out on my fav. pooris. 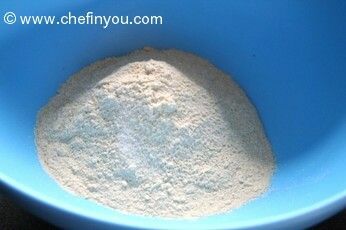 I had purchased some whole wheat flour (American brand) and used the same to make mine. Disaster struck. Here I was waiting in anticipation to devour some fluffy pooris (imagine a bad hungry wolf drooling ;)) , day dreaming about me enjoying the ones my mom made and what came out of my oil was something which did not even remotely look or taste like those :(. Instead what came out were papads (or popaddams as the westerners know it). Crunchy and hard....and FLAT! 3. until it comes together into a pliable dough. I think we would have used around 1 cup of water but it might differ depending on the quality of the flour. So add it little by little while kneading. 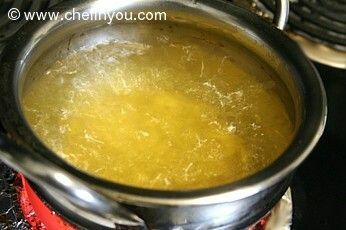 You can also add 1 tbsp or so of hot oil (that you are heating for deep frying) to the dough. The final consistency should not be too tight (dry) or too soft(wet). 4. Knead it well until smooth like below. 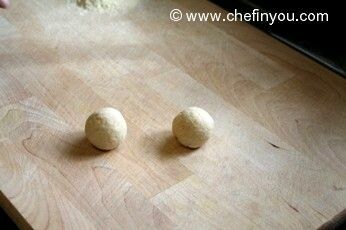 The dough should not be sticky (only v lightly sticky) or feel dry in your hands. Make small balls out of it. These will depend on how big a fryer you have. We intended to make puri of small-med (probably about 6 inch in diameter). Do not let the dough sit. Usually for roti(s), I insist on letting the dough sit for some time which makes the dough very soft. But for pooris this rule does not apply (at least that's what I learnt from my mom). She insists that letting it sit makes it prone to soaking up lots of oil while frying. Hence use the dough immediately to make the pooris. 6. 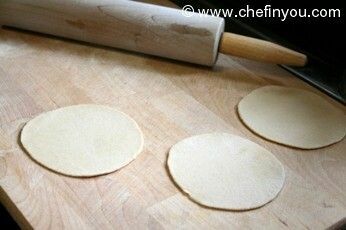 Roll it out into small circles with thin-medium thickness. Don't make it too thin else it will come out crispy. 7. Repeat for all dough. Alternatively heat oil for deep frying. 8. Do the oil-temperature test to see if it is ready. The oil should be hot but not too hot that it smokes. Tips: Drop a small piece of dough into the oil. The dough should fry up immediately and come to the surface. 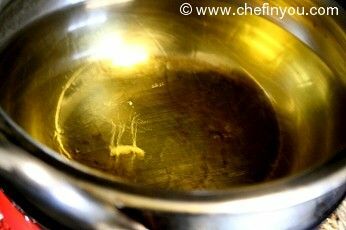 You know the oil is not hot enough when the puri does not puff up, is flat and instead is also soaking up oil. 9. Now drop the poori into the oil. 10. 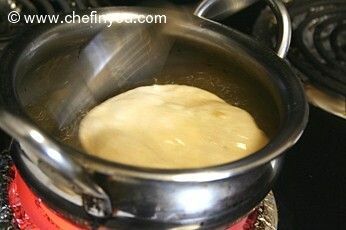 While the poori is slowly coming to the surface, make sure to keep ladling in the hot oil on the surface. 11. This helps the poori to puff up. 13. Place it on paper towel to drain off any oil. If fried right, it wont retain oil. Serve it with side dish of your choice. The famous combo is with Potato Masala (a curry made with potatoes) and also Chole (chickpeas curry). I also know many South Indian families who enjoy it with a condiment called as Pudina Thogayal which is a chutney made with mint and tamarind. The thing I appreciate the most from this recipe is the tip about not rolling he dough too thin. it was perfect! Thank you! I had the same experience as yours while making poori using American brand. However i used indian brand and same thing happens, after frying its like papad. Which brand of atta did you use? @Sonia - Am Mauritian.Pair it with Kheer, theb Indian sweet dish. It becomes a wonderful dessert. Thank you so much Tried as you have writted came out wonderful. God bless take care. I used the bread as a compliment to a ham hock slow cook with plenty of barley and soaked beans (All with the usual veggies) - perfect. Thanks for the recipe. If i use all purpose flour,instead of wheat flour, do I need to add baking powder or should i just follow the rest of your ingredients? Thanks!!!! 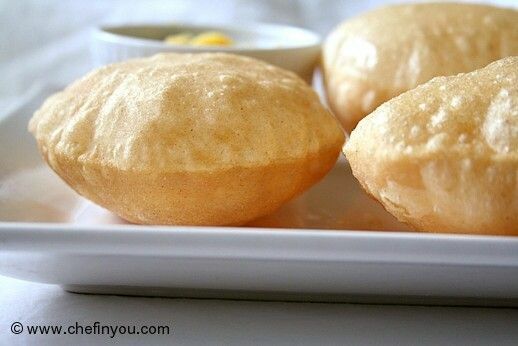 I luv poori very very much...easy to make & yummy!!! 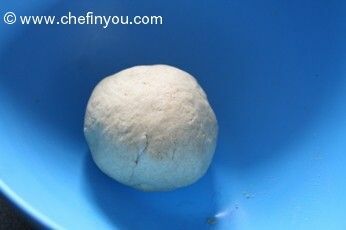 i have not tried your recipe yet, although your tips about not resting dough for puri is interesting . 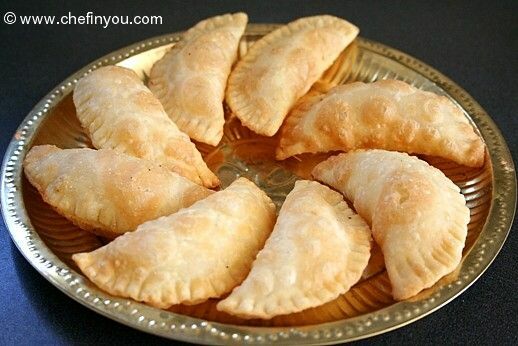 But want to know if you know how to make change which are like puri but crispy yet not too crispy. If you are familiar with that recipe, please post it. Thank you so much for your exact recipe for perfect Puris...I loved every recipe that you have posted. Even tried many...everything came out just perfect. But puri was something I never attempted in my life. I did today & it was just perfectly awesome. Thank You for such wonderful work you do. Love love your blog...Keep up the good work. 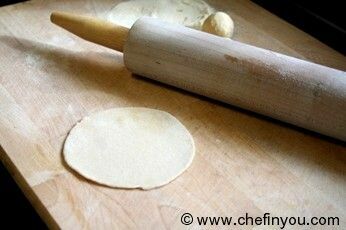 The problem I always face is that when flating the poori it Sticks with the rolling pin. I have tried the same method but the pori sticks. What could be the reason? Fantastic. Simple to make but tasty. First time i tried but it really happend. my baby love it so much. so easy to prepare &nice to eat my baby love it so much. Tried it. God's grace, came out well. Added a bit of suji as well. God bless you. I tried them yesterday, and while some of them puffed, the others did not. Any thoughts on why it might not puff? Thanks! Looks easy to make? May I ask what do we pair it with? Is there perhaps a sweet version, like as dessert? Awesome!!!! I'll be making these this week. Thanks! Do you mix with hot or cold water very important no mention though very frustrating when not specified. Very Nice post...I too big fan of pooris. :wink: :twisted: 8-O :lol: :evil: lovely! please give me one to eat. Very impressive narration.I cant wait to do it today itself ! These look so yummy! Can we have them like Greek pancakes, with honey and cinnamon? Thanx for sharing! Over here in Belgium, I love to make Indian food. Bombay potatoes, chapati, paratha and now these wonderful poori's. They are awesome! I used atta flour. The first one didn't puff. I assume my oil wasn't hot enough. I use a deepfat fryer. Thank you for sharing! Hello - I tried your recipe for puri last night.. 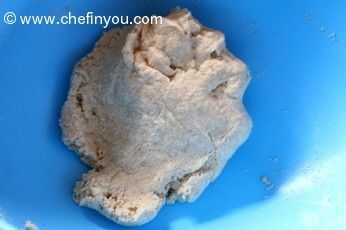 I used atta flour and followed your recipe. The flour mix was good but I think my oil was not hot enough as the puris soaked up some oil. It was definitely a good try for my first time and I intend to try again soon! These were delicious. I won't cook them very often as they are deep fried, but I love them. Jeez .. your pictures of poori are finger lickingly good! This is a great recipe. At first, I tried making it with the wheat flour, but it didnt puff at all. So i tried the self-rising white flour, and every one of them came out so perfectly. I was impressed! I love indian food!!! Just wanted to say thanks for the reciepy. I used to live in India and never bothered to learn it because, well, I thought I probably couldn't get the atta flour back home anyway. By the way, I believe that popaddam is the southern probably Tamil word for it, but they did tend to tell me words in English even though I was asking for it in Tamil or Hindi or whatnot. Can I use simple flour ? Just buy from Ireland local shop will the result same? How deep should the oil be? I don't want to waste oil but want to make sure it's deep enough. Should the heat be more high-medium (close to smoking) or low-medium? Thanks! I'm so greatful for this recipe , my grandfather used to make these for us as kids and its been 14 years since I've had them but the taste remains in my mouth . I love puris !! I also had poori disaster - tried it few times and never came out good. Of course, I blame it on my whole wheat flour. I am going to try it today for Diwali and see if it comes out ok. Thanks for posting the step by step recipe. :-? wish me luck gna try it for the first time! 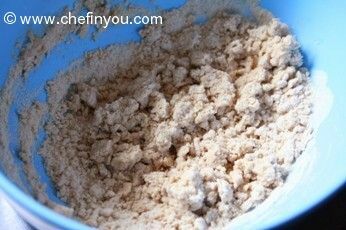 can u use whole wheat flour? My mom adds a couple of teaspoons of oil as well. Makes the dough more pliable and the edges don't crack. When rolling them out they should be no more than 1/8 inch thick. There are tricks to frying them so they puff every time. 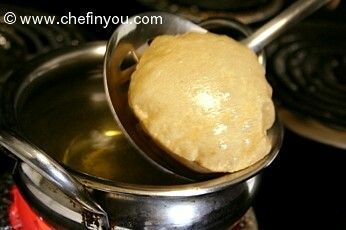 Use a slotted spoon to gently press the puris to keep it submerged in the oil until you feel the puris starting to puff and pushing back on the spoon. As soon as you feel this take the spoon away and let the puffing occur. Also taking the spoon and slowly slashing the oil over the parts that haven't puffed yet helps to get a full puff. 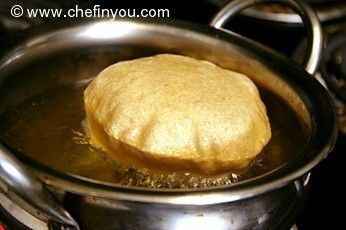 Lastly, you will have to adjust the oil temp-- it has to be hot enough to puff the puris but not so hot that is causes over-browning too quickly. Awesome, I haven't been able to fry a puri properly in two years. After rolling out six, on my final fry I got it to go perfectly. I always thought you were supposed to keep it under the oil at all times, but turns out it works if you just leave it be. 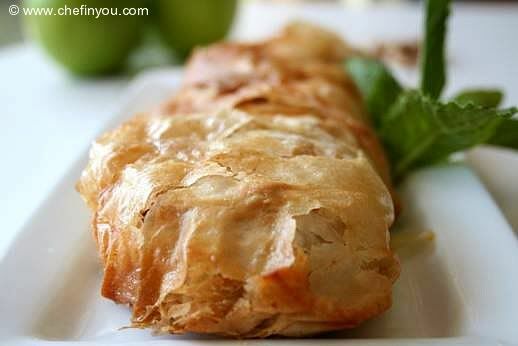 It is a great recipe :) :mrgreen: . But I knew this way before u did. My mother taught me at the age of 5. And mine have always come out fluffy no matter what but the first one wasn't much fluffy. But it has become way better :) :! 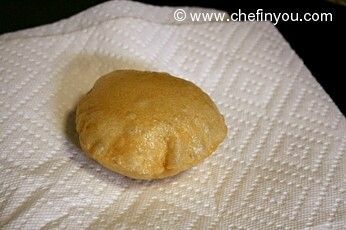 : I would wanna know, when did you start making these fluffy golden brown coloured puri's and tell truthfully?!!!! I'm living in London, but I actually belong to Lahore,Pakistan. Throughout my life I have been a fanatic of halwa puri with chickpeas. I have tasted this in every nook and corner of Lahore. Lemme tell u the restaurants tourists or visitors goto r not the best ones. Nyways I've tried some places in London, there r two major faults..first, the puri's r like fried pappadoms, they lack softness entirely. Second, chickpeas used here r the large ones, whereas small chickpeas which r entirely different ones, r never used here. Have you ever made halwa poori? I am making it for my half-Pakistani boyfriend's boyfriend and haven't a clue where to start! Yours look amazing! I made some Pooris, But they were not fluffy as yours.. can u pls reply me y is that..
Love the fluffy pooris! and your website overall is yummy. I am going to follow these tips for pooris. Thank you. Which brand of chapathi flour do you use? Thanks Usha for the tip.Will try that out the next time,I make puri's.I do add a little gram flour and curd when I make theplas!!!! same here...am a true poori lover but seldom make them. perfect poories you have made here. Merry Christmas. 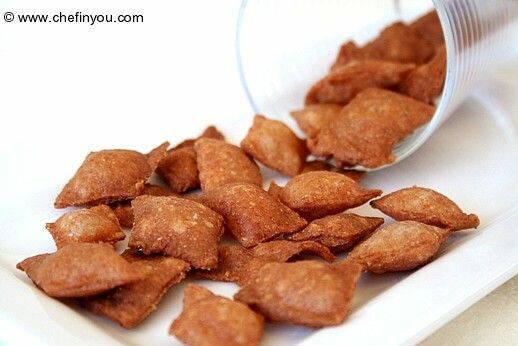 Fluffy pooris tempts me a lot..
My favourite dish...and it looks perfect...wonderful. I too love poories! We make undhiyo and jalebi along with poori...Bliss! I add half tsp of sugar to the dough...it gives colour as wells as the crisp and the strength for the fragile layer. Love those plump and tempting pooris. Happy holidays and festive greetings from another Pooriholic. I have tried poori's with the same American Brand of Wheat flour and it did turn out to be Papad's :wink: I am yet to try it with regular atta and hopefully mine will come out as good as your's..Lovely DK!! Can I say same pinch?Coz blame the flour is what I did too when I didn't get it right the first few times.I thought puffed up pooris had eluded me forever! !Now I can safely say I have come out of that stage and can make fluffy pooris,but alas,the word diet and calorie-laden has entered our dictionaries..sigh,why does life has to be so hard???????? 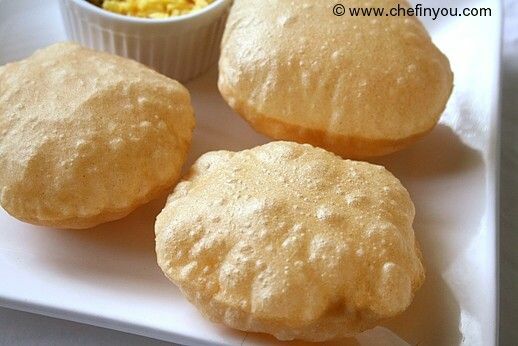 Love your pooris,have never seen any pics with fluffed up pooris,how could you resist without eating it??? I love pooris so much I think it's a little bit wrong! I love them with Indian food of course (lamb saag and keema curry and egg curry particularly) but oh my god they are good with scrambled egg with onions, for breakfast. Childhood heaven and still now as well!